Veteran death metal artist Ed Warby (Gorefest, Hail of Bullets, Ayreon, Star One) returns with his The 11th Hour project: Lacrima Mortis is another adventure in and experimentation with doom metal. 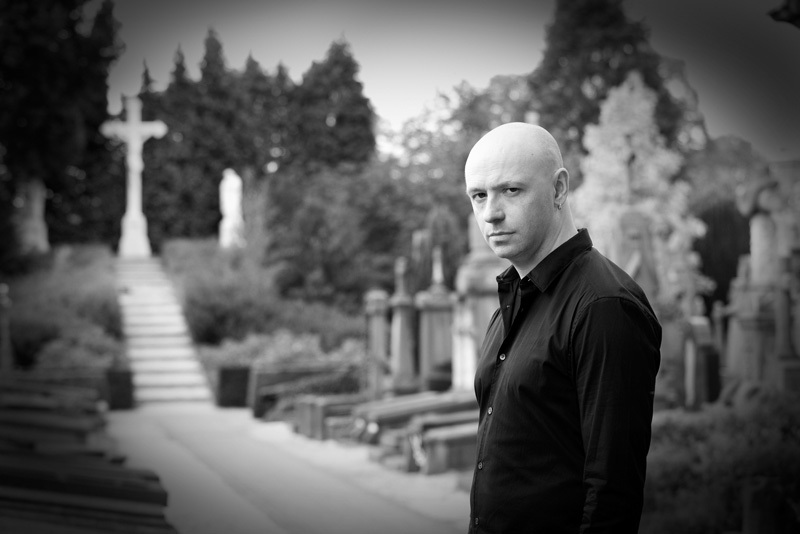 Friend and fellow doom soulmate, vocalist Rogga Johansson could not participate this time due to a prolonged illness. Filling the gap on death growls is touring vocalist Pim Blankenstein. 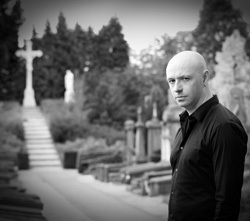 Above, Ed Warby: dressed in black, visiting a cemetery and photographed in black and white ... gloom and doom indeed. Doom metal doesn't adequately describe The 11th Hour sound. Better it should be called doom death metal as Warby can't free himself from this death metal roots. Blankenstein supplies death vocals (maybe some of the clean?) here. Thankfully, he's quite good. Despite my predilection to dismiss or simply despise death vocals, I know when they're done well. And here they are. They're actually bearable. Yet doom metal speaking, Lacrima Mortis delivers. Heavy and mostly plodding, dark, gloomy, and sad, Warby gets it. But that's basically all he gets. The subject material remains death, despair, and all things grim. Check the song titles if unconvinced: We All Die Alone, The Death of Live, Nothing But Pain or Bury Me. 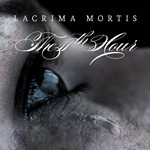 Then, check the album cover: lacrima mortis means 'the tear of death.' Warby's Netherlands must be a sad territory. Additionally, the injection of death metal vocals to doom metal is hardly novel. Lacrima Mortis is more a service of personal self-indulgence, or more positively, personal artistic experimentation, than a brilliant new contribution to the genre. Actually, you might hear more traditional heavy metal mixed with the doom, a greater variation from his previous release. Nevertheless, Lacrima Mortis offers some gems including Tears of the Bereaved, almost upbeat at the start if you can believe it, and The Death of Live. Honestly, doom/death metal fans will be pleased with Lacrima Mortis. But promise me you won't drink too much alcohol while you listen to it. You might despair enough to actualize your own unfortunate and untimely end. Ed Warby returns with his The 11th Hour project and Lacrima Mortis: more gloom and doom metal inject with death metal vocals. Carry on.